A year had passed since my last visit to the Kgalagadi Transfrontier Park which straddles South Africa and Botswana. Form a photography point of view I had upgraded my cameras from the D700 and D800 to a D750 and D810 so I was excited to use them in anger to see the improvements. Planning a trip to the Kgalagadi is required at least 11 months in advance to ensure you can secure accommodation in your favourite camps. Something else which was different was the I squeezed in a second 7 night trip mid January 2015 as I felt I wanted to explore a different part of the park. The North Eastern part of the park had not seen much rain in the months prior to December so we arrived in a very dry Auob River bed. 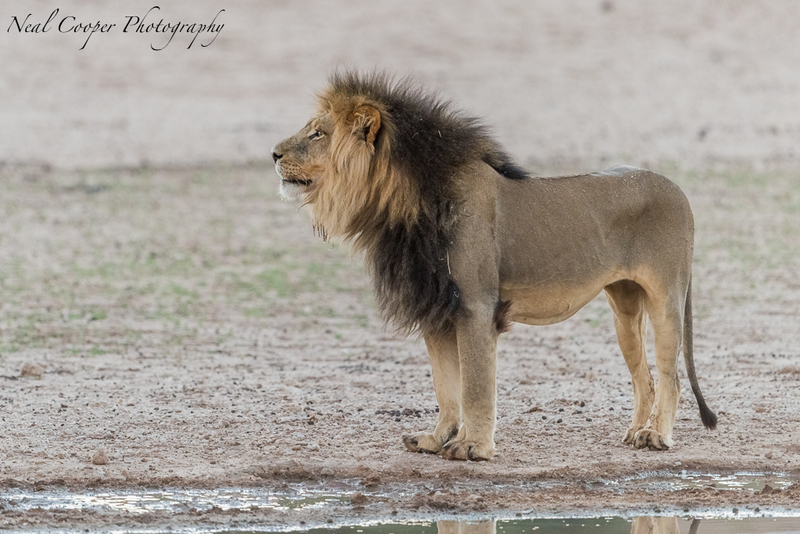 As we arrived at Urikaruus wilderness camp and started to unpack a male Lion came walking down the opposite river bank on his was down to the waterhole. As the sun had just dipped behind the opposite river bank my first challenge for my Nikon D810 was to shoot the Lion in low light at a distance of about 60m and still get a useable image from the scene. I started with a low ISO to try and get a clean image and as the subject was at a distance to me I used a f stop of F/4,0. We also had a great sighting one morning at Veertiende Boorgat as 3 Lioness tried to take down one of a herd of Giraffes who initially kept a close eye on the trio until the charge when they all scattered across the river bed. The Lioness initially jumped the muddy patches around the waterhole where they drank and then regrouped before the hunt. 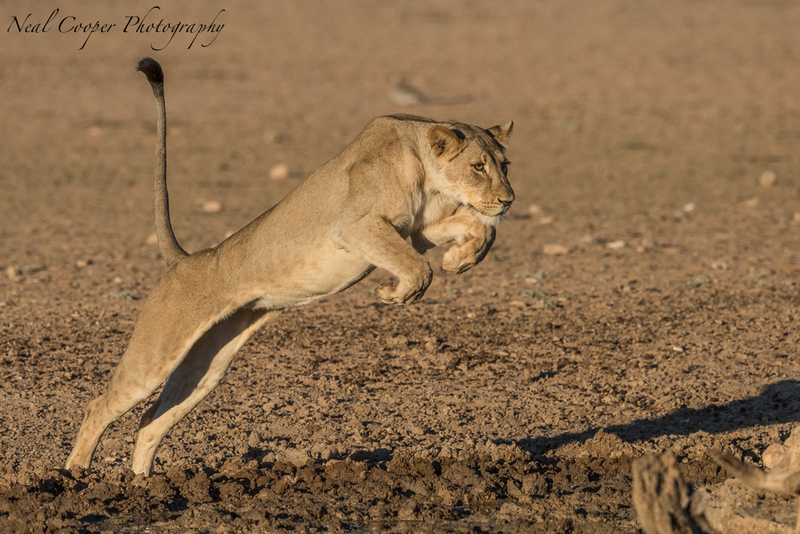 A Lioness jumps across the muddy puddles around the waterhole. 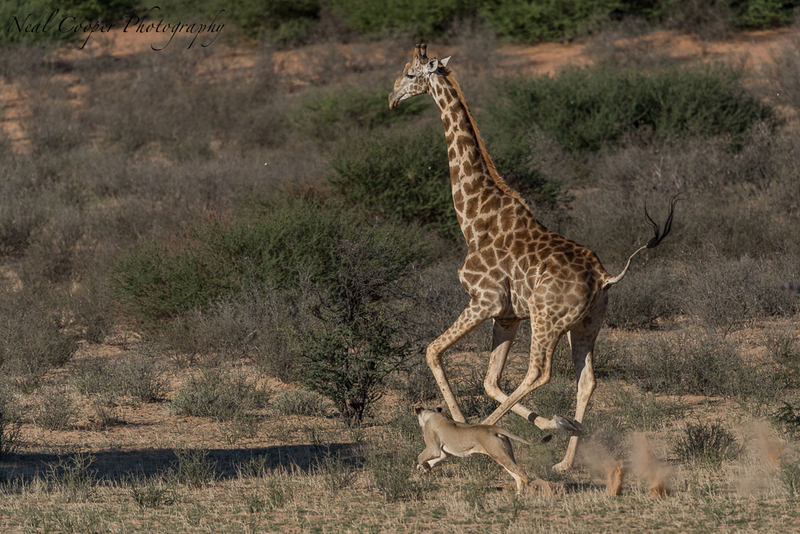 A young Lioness chasing a Giraffe across the Auob River bed. A thunderstorm was brewing at Dalkeith and while we sat there and photographed two Cheetahs the storm broke and a fierce wind accompanied driving rain. The rain and dust was blowing directly towards our vehicle so we would get our cameras ready, drop the windows and get off a few frames before closing the windows again. The lightning was striking at short intervals and I managed to get one image, with my D4 / 70-200mm f 2.8 combination, of the lightning striking across the river bed. I just hit the shutter button as soon as I saw a lightning flash and was fortunate to get this image. 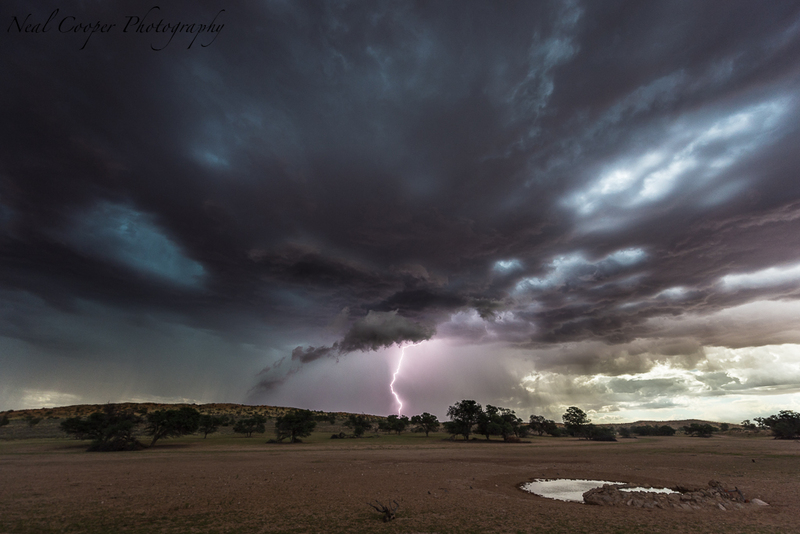 A lightning strike at Dalkeith waterhole. We also managed to get some very nice images of a Cheetah with a damaged right eye drinking from the waterhole. I tried to get my vehicle in the best position to get some view of the water as well. 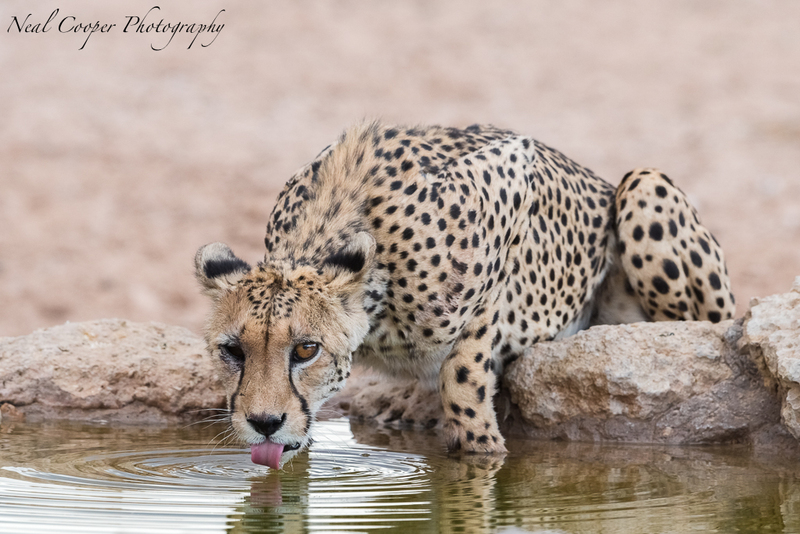 An injured Cheetah drinks from the Dalkeith waterhole. As the rain was falling, a family of a lioness and 4 cubs came walking out the bush towards the water but paused every few meters to lick the water from the fur of the others. They continued to do this even after they were close to the water. The challenge here was to get a high enough shutter speed in the very low light at decent ISO setting and still be able to use a f stop that would allow enough depth of field to get the whole family sharp. I used my D4, 70-200mm combination again. I decided to convert this image to black and white as it added to the mood. 1/1250, f 4.0, ISO 800. 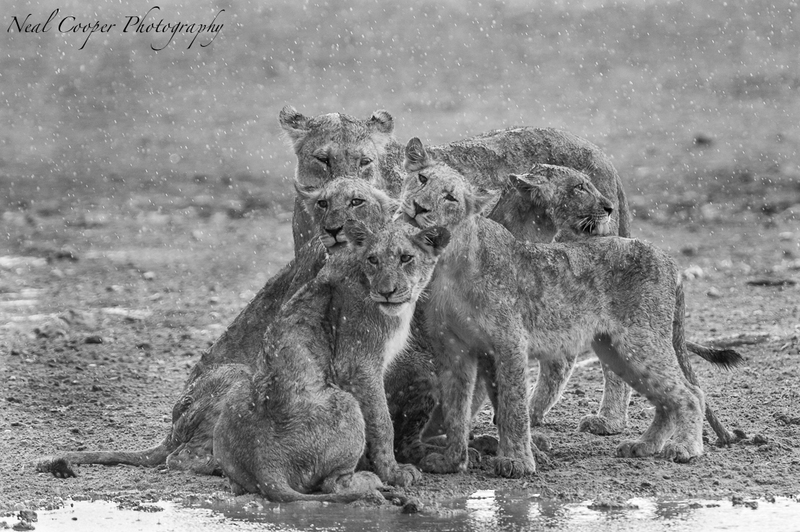 A family of Lions sitting in the welcome Kalahari rain. 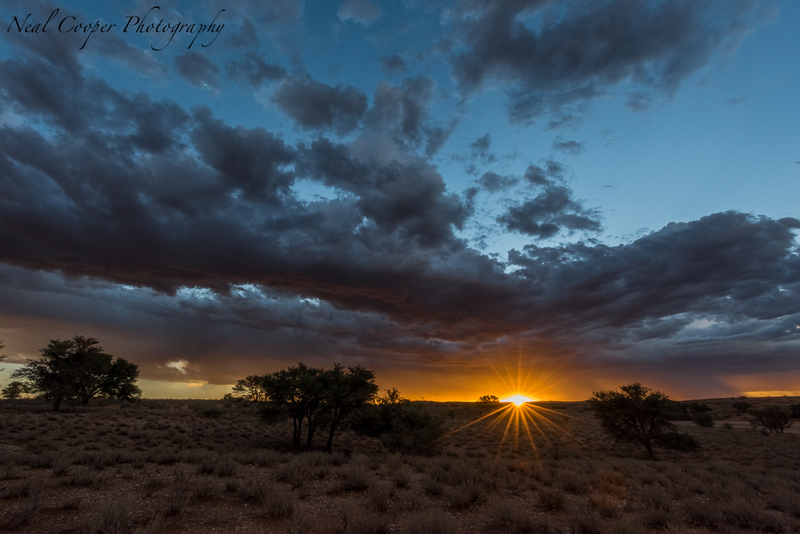 To end the first 24 hours in the park we had spectacular sunsets with rain still falling in Southern Namibia. I wanted to get the sun rays so opted for a high f stop number. A beautiful Kalahari sunset after an exhilarating day. In addition to Lions, Cheetahs, and other general game I also got my first images of a Damara Mole Rat. Great shots and stories, Neal!!! Neal, I love the colours, sharpness, mood and story-telling. Great job! Thank you very much Mike. I appreciate your comment.